Photograph; a sepia photograph of upper Trafalgar Street, Nelson. In the foreground of this black and white image is a row of soldiers, behind them is a large crowd of people, who line the street and the roof tops. The crowd extends up the hill, at the top of which stands Christ Church Cathedral. A large number of telephone wires cross the street between buildings. 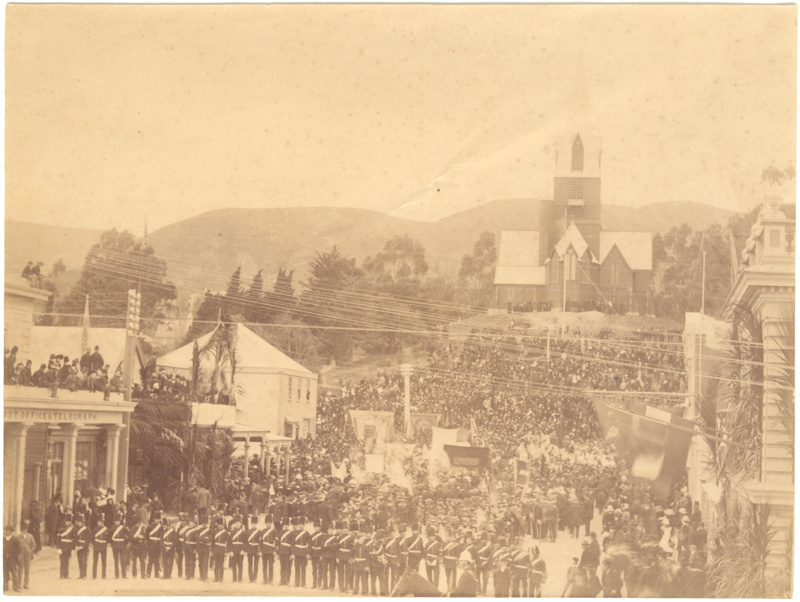 This photograph depicts either Queen Victoria’s 50th or 60th Jubilee, in 1887 and 1897 respectively, or Nelson’s 50th Jubilees in 1892. Many of ‘the Mob’ who had settled Hurworth migrated south to Nelson in the 1860s, fleeing the conflict of the Taranaki Land Wars.